We have a great show lined up this week. Our in-studio guests are Nicholls State New Head Coach Tim Rebowe and Former N. Y. Jet and McNeese State player Rusty Guilbeau. Coach Rebowe has coached within Louisiana his entire career. The last several years he has been an essential part of the Louisiana-Lafayette’s success as an assistant. Anyone who knows Coach Rebowe will tell you this was the right man for the job. Guilbeau was an All-American at McNeese State in the early 1980’s. He also went on to have a successful career in the NFL. Also, we will announce our 4A Honorable Mention Players of the Year. 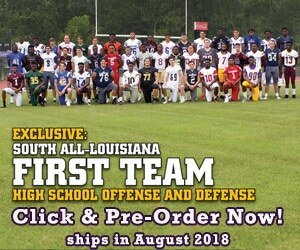 It should be a great show so make sure to Tune into Louisiana Football Magazine and TV! Here are the listings for our show this week.